On September 20, 2008, the Different Skies ensemble performed a ninety minute live concert of experimental and electronic music for an audience at Arcosanti in the Arizona desert just north of Phoenix. The more melodic and conventionally structured pieces from the show were gathered onto a CD called The Scorpion Chronicles, but three pieces from the program were omitted for reasons of length and due to their more ambient and atmospheric nature, a change in mood not in keeping with the rest of the concert material. This release combines those three pieces with a set of thematically compatible 'All Star Jams' (live freeform improvisations) that were created by the ensemble after the formal concert on the 20th, and in evening jams the three previous nights. The four movements of the title track were actually four distinct takes of the concert piece, three rehearsals and the live performance; because the piece had only a basic gestural guideline and choice of key, all four movements were completely different, yet with enough cohesion to be assembled after the fact into four parts of a larger suite. 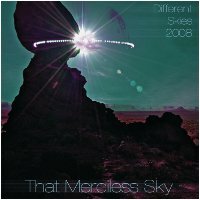 We are pleased to offer the previously-unreleased ambient sections of the Different Skies 2008 concert here, with supporting material to create a delightful counterpart to The Scorpion Chronicles. For more experimental excursions into live improvisation, you'll want to hear Arcosanitarium, the companion release to this one. We hope you enjoy them both.